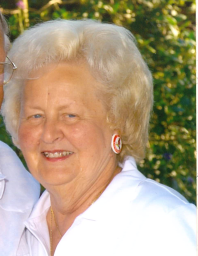 Doris M. (Pocock) Sorrells 90 of Raymond Passed away March 24, 2019 at Tremont assisted living center in Hillsboro. She was born Feb. 23, 1929 in Nokomis IL to Chester and Pearl (Pray) Pocock. She was a graduate of Nokomis High School. She married Earl Sorrells in Nokomis on June 20, 1948. She was a member of A Community of Faith Church in Raymond, She worked on the family farm, including bringing daily lunch to those working, She worked at Sorrells Farm Supply in Raymond, She did promotions for the Illinois Soybean Association, member of the Illinois Livestock Feeders, participated in commodity day at the Illinois extension office, member of Raymond/Harvel Kiwanis including being sunshine lady, member of the local eastern star and 31 year member of the Raymond Buckeyes 4-H and Illinois 4-H Hall of Fame. She is survived by her husband of over 70 years, Earl, four children Mark (Nancy) Sorrells of New York, Jean (David) Fuchs of Raymond, Brenda (Blake) Cloyd of Springfield and Kent (Sandy) Sorrells of Raymond, 10 grandchildren Shawn Sorrells of Pennsylvania, Trevor Sorrells of New York, Gwen (Dustin) Ziegler of Washington, Rachael (Jon) root of Colorado, Garrett (Sydney) Fuchs of Harvel, Ben (Katie) Cloyd of Colorado, Bart (Melanie) Cloyd of Michigan, Brooke (Zach) Bell of Springfield, Tara (Zach) Gahr of Normal and Megan (Bard) Humbert of Chicago, 13 great grandchildren Morgan and Mia Root, Layla and Emma Ziegler, Vale and Reid Fuchs, Beckett and Lincoln Cloyd, Cooper and Tucker Bell, Charlotte Cloyd and Riley and Reese Gahr, and one sister Donna Clayton of Colton. She was preceded in death by her parents, one grandchild Tonya Fuchs and one sister Jean Johnson. Memorials can be directed to Raymond Park District or Donor’s choice. Funeral services will be Thursday March 28, 2019 at, A Community of Faith Church in Raymond at 11:00 AM with Tom Mulch officiating with visitation from 10:00 until service time. A visitation will be on Wednesday March 27 from 4 until 7 PM at the church.